1. Straight lines are shorter than curvy, snake routes. I zigged and zagged, looking for the fast water when I should've just kept it simple. Making the course longer does not help your chances for placing and thinking too hard about where you need to be just gets in the way of laying down clean strokes. Lesson: Keep it simple, be decisive and stick with a plan- the middle of a race is not the time to go prospecting. Loop Results 1 - 51: Notice that the SUP category isn't broken down into divisions? I think that 1st place in Stock was Kiwi a.ka. 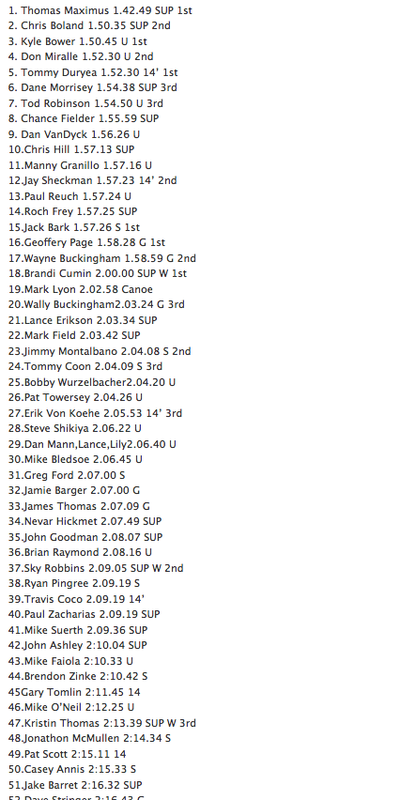 Mark Field, 2nd in stock was Paul Zacharias and unless Mike Suerth was on a stock board, I got third! There were relatively few stock racers in this one- most chose to paddle 14' and Unlimited boards. 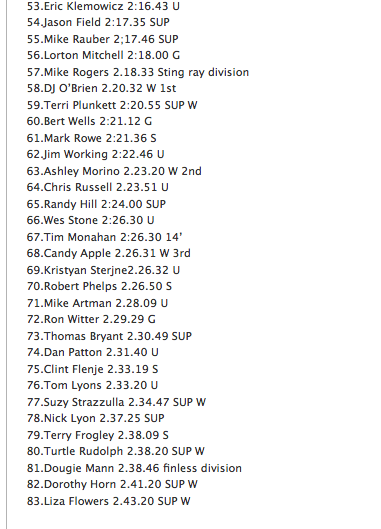 Loop Results 53 - 83: The field was relatively large- and FAST. 2. Stable is fast: Once again, the confused chop and swell outside of the Bay did me in. I was horribly slow out there, unable to feel comfortable while I was pitching around and also unable to get into my rhythm. I think I could've shaved two minutes off my time if I would've felt stable enough to lay into my paddle. Lesson: In my case, a wider board might be a faster board. 3. Save something for the end: Right when I needed it- I was gassed out. 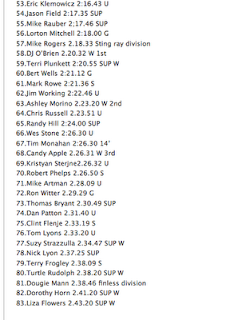 A solid kick at the end of this race might have netted me a couple extra spots but at that point I was tapped out. Lesson: train for the end of the race... this means do more intervals! Hey John- you've inspired me into my first SUP race in Santa Monica on June 11. Any advice for a newbie paddle chick? Can't wait but I'm a little nervous about the sand start. First Race? Awesome! Can't wait to hear all about it... the nervousness, butterflies, worries... that's all a part of it- when you finish and overcome all of that the sense of accomplishment will blow you up. You know- I think I'll write a piece on advice for a first race... sounds like a good one. I'm bummed, I won't be at that race- I'll be down in mainland Mex surfing (so I guess I'm not too bummed)- but I will be at next weekend's Hobie/Hennessey's race in Dana Point. Watch out, if you get bit by the race bug- we'll be running into each other all over the place!